For months, weeks, days I keep telling myself that I’m going to be more active with my posting on my blog, which is to say, I’m going to add to the ONE post I have. I think part of this delay has to do with fear – it’s the same fear that often paralyzes me on Instagram – standing on the precipice of putting yourself out there in the hopes of affirmation, likes, followers, fans etc. All that stupid ego-driven nonsense that we are all guilty of wanting, even if we don’t say it out loud, even if it exists as silly whispers in our hearts. If I was writing this all for myself, with no hopes or pressure of attention or success it wouldn’t matter. It would be like dancing with the lights off. But in this format, online, out in the world, suddenly it matters more. I’ve been telling myself to dedicate Mondays and Tuesdays to blog posts and even though it’s Saturday and despite my type-A perfectionist tendencies I’m going to just freaking go for it. A couple weeks ago I went into the email I set up in conjunction with my website - I check it about once a month as it is often empty or full of a litany of irrelevant updates from Squarespace but never any real business news - and I found an email from someone who was referred to me by another florist. I can't explain how encouraged and warmed my heart was by this little piece of news. My early adventures in flowering have been full of great learning experiences and despite how mad it can be and the fickle nature of the blooms and the early mornings I do still really love it all. Only caveat is that I often feel quite alone - operating and floating on my own little island in my own little bubble. And that's okay – I suppose it’s part of being the new kid in class but this referral was a wonderful reminder that there are people out there who embody that sense of community and though it was just one small referral, it meant the world to me. It was heartening beyond words – like the first spring days when it’s still light at 6:00. “I believe they call this wonderful skill Ikebana......and I also believe in addition to your fine intellect and great heart, you may have uncovered another extraordinary genetic discovery. How cool is that. I felt simultaneously touched and strangely saddened by these two generous pieces of correspondence I received and I figured the best way to relive myself of this unbearable lightness would be to write about it. Consider yourself subjected. At what I can only estimate to be the halfway point of a long, arduous, heartbreaking, wanderlusty journey as a writer I accidentally stumbled upon flowers. As an immovable type-A personality Taurean, I didn't really even entertain the possibility of veering off course from what had become a seemingly Sisyphian endeavor: to get paid to write. To make it in New York as a writer. When flowers spilled into my life I was still attempting to go for it - murmuring silent uninspiring inspirations like "Rome wasn't built in a day" or "Today is the first day of the rest of your life" and any number of variations on the hang in there theme. I pitched a story to New York Magazine's The Cut on the flower girls of Brooklyn - I had seen them around, I had noticed their distinctly earthy and fashionable sartorial stylings - they were, to me, these lovely earth mother creatures and I wanted to stand in the same room with them and their flowers. I did a Style Profile on them - http://nymag.com/thecut/2013/04/style-tribes-the-flower-girls-of-brooklyn.html - photographing each of them in their heady and dreamy studios and I think that was when a small tea kettle in the back of my mind started ever so quietly whistling. Then came an incredibly disappointing February where all my connections (I say all but in reality they were meager at best - nonetheless they were mine) fell through. Editors left, budgets were cut, and I was just another faceless freelancer. That was when I felt the feeling we all feel here in New York from time to time - shoulder to shoulder with inspiration and talent and the hope of opportunity - I suddenly felt like I had no options. I felt like I had so tirelessly and blindingly pursued a goal only to reach the point where I had to start all over again. I couldn't. I hit a wall. I planned to launch a blog with the blind fever that comes with a new project - I had delusions of grandeur, sussed out all my connections, dreamed of fame, shot a couple style profiles only to have the easy languid limbs of summer ferry me away from the blog and away to several wonderful trips upstate where flowers howl and spill all over the damn place. I started to play. I started arranging them. I loved it. And as Fall approached I started to think I could maybe try to do this. I never said it out loud to anyone except my boyfriend - I wanted to keep it a secret in the fear that, like writing, it might not work. It felt like the beginning stages of when you first fall in like with someone - looking to protect my heart I downplayed what I was doing ("Yeah, we're just kindof hanging out - no commitment right now - I mean, we're just having fun right now and seeing where it goes.") but then it became clear that I was really pursuing this. I hit the honeymoon stage - happily and eagerly learning the names of flowers, falling into an online black hole, clicking from one floral image to another, exhilarated, looking through the keyhole into this secret universe. In one of my cyber wanderings I stumbled upon Constance Spry - one of her arrangements is pictured below - and was just so inspired by this woman who pioneered the floral frontier. Spry taught people that they could beautify their homes with flowers plucked from hedgerows and scraps of wasteland and encouraged the use of unassuming materials like berries, vegetable leaves, twigs, ferns and weeds displayed in what were unthinkable vessels like gravy boats and bird cages, to tureen lids and baking trays. 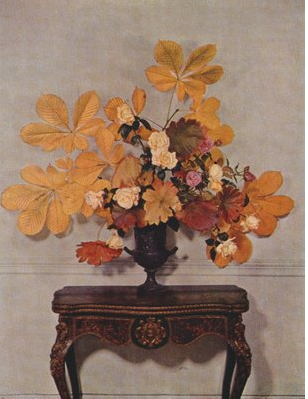 In an era when millions of people were decorating their homes to their own taste for the first time, Constance Spry helped them to do so with flair and for very little money. Believing that everyone had the right to beautify their home and that the means of doing so could be found in woods and the nature that surrounds all of us Spry popularized her essentially bohemian style of home-making by dispensing no-nonsense advise in books, articles and radio broadcasts all over the world. “I do feel strongly, she once wrote, “that flowers should be a means of self-expression for everyone."